Come and enjoy the pleasure of creating fascinating images using both traditional and creative basic printing techniques. 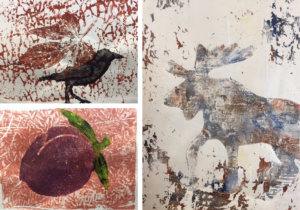 We will experiment with stamping, monotype printing with plexiglass, gelli plate printing, block printing and more. This course will be lots of fun for any artistic skill level. Please bring a brayer and whatever watercolours, acrylics and paper you have. During the last class, students will have the opportunity to create a print using one of the arts center’s printing presses. Price includes all other materials. Materials: Some materials included in price. See above for other supplies.